(1) You close the door. (2) The door is closed by you. The first sentence is active, second is passive, and the last is imparative. However, if you take a look those closely, you will find that those three are very closely related, even identical. They seem to be identical, since they have the same undelying abstract representation that is called deep structure. It is defined as an abstract level of structural organization in which all the elements determining structural interpretation are represented. If you want to analyze the relation of those three sentences, the first you have to know about the deep structure of them, since deep structure is the input of transformation rules. We cannot apply transformation rules if you don’t have deep structure. transformation rules are sets of rules which will change or move constitiuents in the structures derive from the phrase structure rules. From the above example, it can be concluded that deep structure then is a pure representation of thematic relations. Anything which is interpreted as the subject or object of a given predicate will be in the subject or object position of that predicate at Deep structure no matter where it is found at Surface structure. 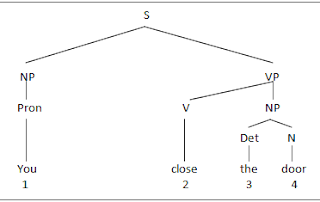 "The surface structure of a sentence is the final stage in the syntactic representation of a sentence, which provides the input to the phonologicalcomponent of the grammar, and which thus most closely corresponds to the structure of the sentence we articulate and hear. . . . This two-level conception of grammatical structure is still widely held, though it has been much criticized in recent generative studies. An alternative conception is to relate surface structure directly to a semantic level of representation, bypassing deep structure altogether. . . . The term 'surface grammar' is sometimes used as an informal term for the superficial properties of the sentence." "[T]he generative grammar of a language specifies an infinite set of structural descriptions, each of which contains a deep structure, a surface structure, a phonetic representation, asemantic representation, and other formal structures. The rules relating deep and surface structures--the so-called 'grammatical transformations'--have been investigated in some detail, and are fairly well understood. The rules that relate surface structures and phonetic representations are also reasonably well understood (though I do not want to imply that the matter is beyond dispute: far from it). It seems that both deep and surface structures enter into the determination of meaning. Deep structure provides the grammatical relations of predication, modification, and so on, that enter into the determination of meaning. On the other hand, it appears that matters of focus and presupposition, topic and comment, the scope of logical elements, and pronominal reference are determined, in part at least, by surface structure. The rules that relate syntactic structures to representations of meaning are not at all well understood. In fact, the notion of 'representation of meaning' or 'semantic representation' is itself highly controversial. It is not clear at all that it is possible to distinguish sharply between the contribution of grammar to the determination of meaning, and the contribution of so-called 'pragmatic considerations,' questions of fact and belief and context of utterance." "[Noam] Chomsky had identified a basic grammatical structure in Syntactic Structures  that he referred to as kernel sentences. Reflecting mentalese, kernel sentences were where words and meaning first appeared in the complex cognitive process that resulted in an utterance. In [Aspects of the Theory of Syntax, 1965], Chomsky abandoned the notion of kernel sentences and identified the underlying constituents of sentences as deep structure. The deep structure was versatile insofar as it accounted for meaning and provided the basis for transformations that turned deep structure into surface structure, which represented what we actually hear or read. Transformation rules, therefore, connected deep structure and surface structure, meaning and syntax." "The remarkable first chapter of Noam Chomsky's Aspects of the Theory of Syntax (1965) set the agenda for everything that has happened in generative linguistics since. Three theoretical pillars support the enterprise: mentalism, combinatoriality, and acquisition. . . .
"The first sentence is active, second is passive, and the last is imparative." Don't you mean "imperative?" Perhaps this was a “slip of the tongue.” In the deeper level he was making a “comPARison,” and the “PAR” slipped out.